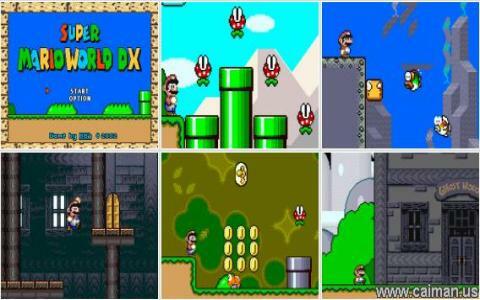 Mario Worlds is a 2003 game that presents a beloved and popular animated character we all grew with: Mario! I have to say I still play this cool game that doesn't get old, even today! Mario confronts once more with a hard situation, preparing for a new adventure. He has to face many obstacles, avoiding to accidentally jump in the abyss, eating mushroomns for survival and collect various bonuses. The controls enable running, jumping, becoming bigger, in order to gain extra resistance in front of your enemies. The variety stays in the different and exciting types of backgrounds/environments: forests, deserts, and in the weather conditions, the rain for example. Another good thing is that you can save your progress during the game. The graphics bring colorful visuals and details that are very catchy and pleasing on the eyes avid for beauty. The music and sound effects are suitable for the kind of action you involve in. There is nothing repetitive in Mario Worlds, and everytime you finish a level, you want to replay and live the brilliant gameplay over and over again! If you already discovered the fantastic, influential and addictive universe in other Mario games, you will definitely love this game too!